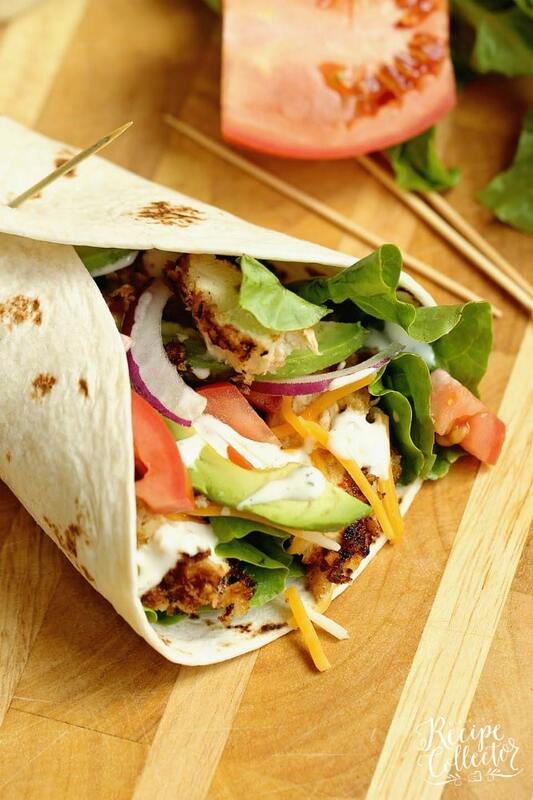 Crispy Chicken Wrap – Stuffed with panko-coated chicken, diced tomatoes, sliced red onion, avocado, shredded cheese, and ranch dressing. 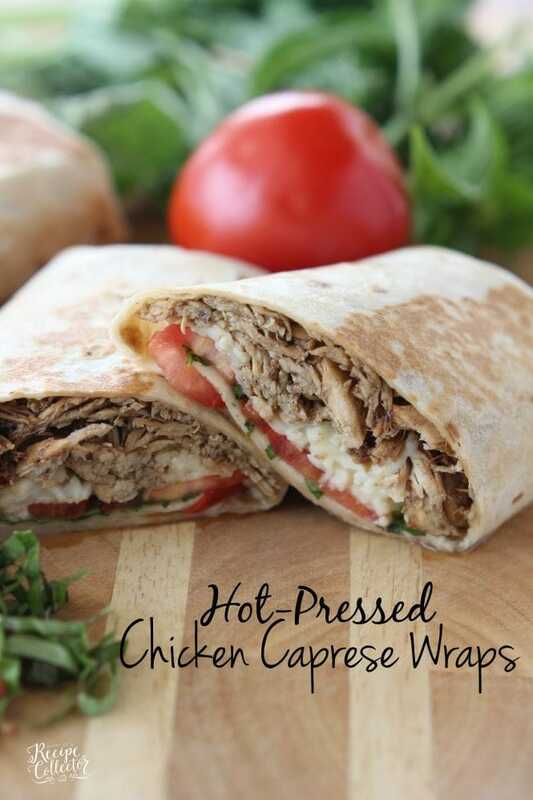 It makes a great weeknight dinner or lunch idea! I’m sure you guys have noticed how I love a good wrap around here! 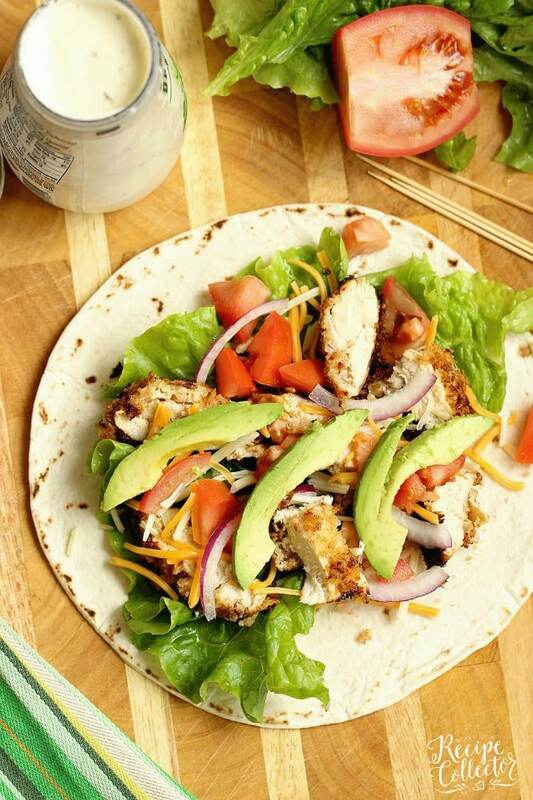 This Crispy Chicken Wrap is no exception. 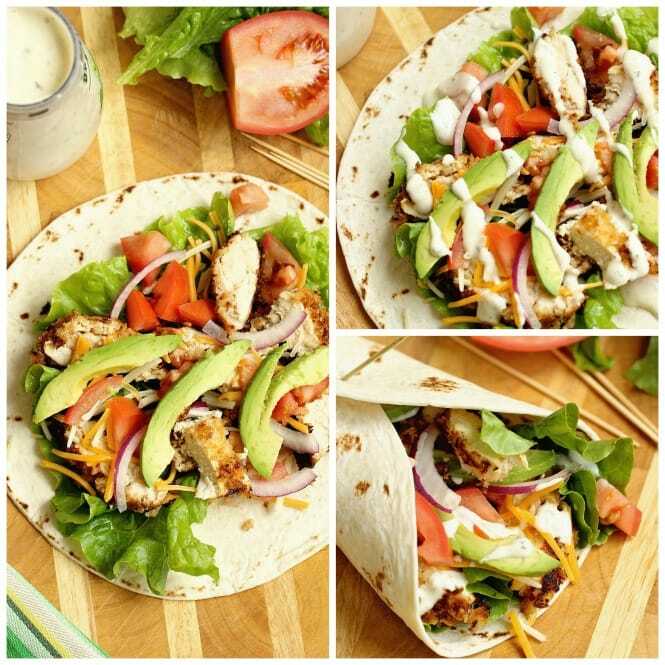 Wraps are just great weeknight dinner ideas. 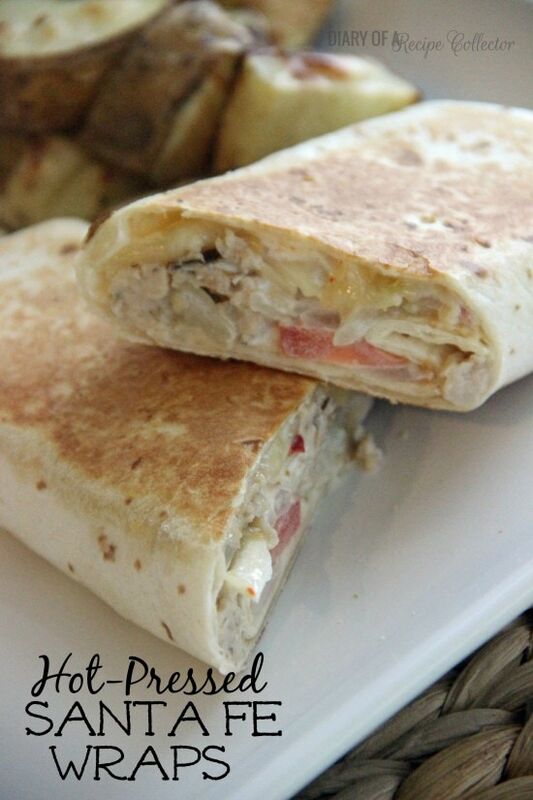 Plus the leftovers are great for lunch too. It’s pretty much been back to school business around here. School officially starts next week for us. It’s always very bittersweet. We’ve had a great relaxing summer, and it’s hard to say bye to all the summer fun. But I know my kiddos are ready for a routine! I don’t think I can here “I’m bored” one more time. Hope you enjoy this one!! Place chicken in a gallon storage bag. Add 1 tsp creole seasoning and Italian dressing. Seal bag and mix around to coat chicken. Refrigerate for about an hour. Pour panko into a shallow bowl. Add ½ tsp creole seasoning and stir. Remove chicken from bag and dip into panko to coat both sides. Heat olive oil over medium high heat. Add chicken and cook 7 to 8 minutes per side. Lower heat if chicken is browning too quickly. Remove to a paper towel lined plate and let cook for a few minutes before slicing. 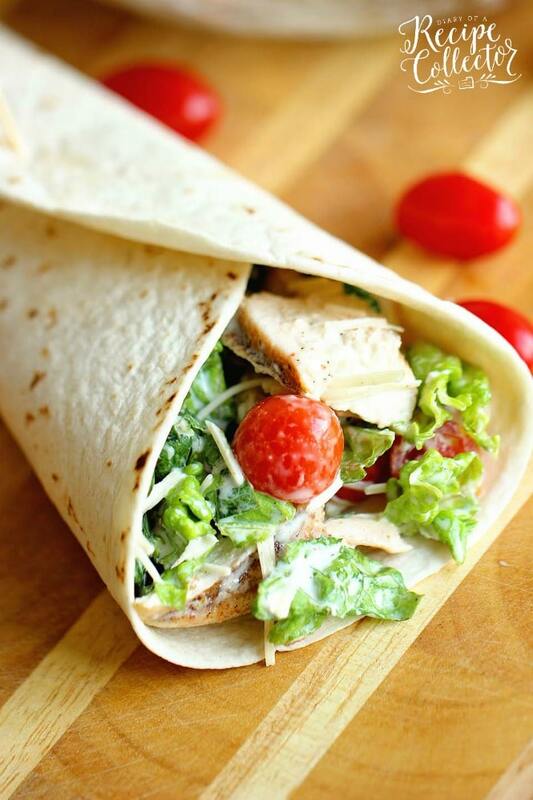 Assemble wraps by layering green leaf lettuce, sliced chicken, tomato, avocado, onion, shredded cheese. 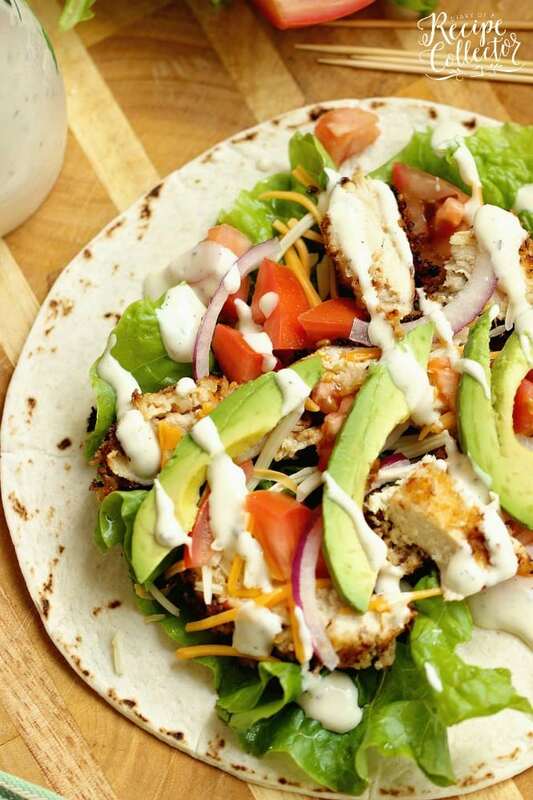 Drizzle ranch. Roll up and secure with a long tooth pick. *I use a high quality ranch found in the produce section.